Basic pant pattern slopers custom fitted to a doll and used to make pants and shorts for that doll. Photo copyright 2010 Lesley Shepherd. To make pants for any size or shape of doll you can begin by making a basic pants sloper fitted to your doll, then use that to draft patterns for all styles of removable doll clothes pants and shorts. It is not difficult to create a custom sloper pattern. To make it you will need sharp scissors, a pencil, sticky tape, and a bit of non woven lightweight interfacing. Interfacing is used as it curves well and does not fray on the edges. When you make the sloper for your doll, you will have the basic outlines of the doll's shape in a flat form. In order to use the sloper to make patterns you must keep in mind how much movement your doll has, in order to use the sloper for a pants pattern for pants which are easily to fit onto the doll. If the doll has large non moving feet, or a large difference between the waist and hip measurement, you will need to take that into account when you draw up pants patterns. It is easiest to make an accurate pants sloper for a doll if you have made a basic torso sloper first to learn some of the techniques. To make full sets of dolls clothes you will need a torso and a pant sloper for your doll. Continue to 2 of 14 below. To begin making a pant sloper for any size or scale of doll, cut a rectangular piece of interfacing which is longer than the distance from the doll's waist to it's feet, and wider than necessary to wrap around the doll from the center front to the back of the doll. Pants patterns need a front and a back section to adjust for the curves on the doll. You will need to make a front and a back sloper, using similar methods. Start making your sloper by trimming one long edge of your interfacing to a straight edge against a ruler. Use tape to line the straight edge of the interfacing up with the mid line along the outer edge of the doll's leg. In the photo above, the fabric is being attached to the front of the doll's leg. If your doll has a lot of moveable joints, make sure the leg is in its most upright or straight position when you attach the tape to hold the edge of your straight interfacing along the side center of the doll's leg. Continue to 3 of 14 below. Fit the interfacing around the top of the doll's leg and across the front of the doll to mark the waist and center seams for a basic pants sloper custom fitted to a doll. Photo copyright 2010 Lesley Shepherd, Licensed to About.com Inc.
With the interfacing held straight along the outside seam of a dolls leg, the excess fabric towards the front of the doll, gently move the interfacing over the doll's front, keeping the interfacing straight to the center line of the doll's waist (see photo above). Do not pull on the interfacing, you want it to gently roll over the doll from where you have attached it along the center of the doll's leg at the side. Don't worry about the fact that the fabric gapes at the doll's waistline. Use a bit of tape to fix the interfacing to the torso of the doll and mark the doll's waistline on the interfacing. Trim the excess fabric above the waistline away, and fix the fabric back in place with tape as shown in the photo above. Continue to 4 of 14 below. Use a soft pencil to mark the center front line of the doll's torso down to the base of the torso. Do not adjust the interfacing fabric as you do this, you will fit the interfacing to the base of the doll's torso after you have trimmed it a bit. If you have a hard time deciding where the front line of your doll is, use existing mold lines, or use the center of the breasts or a line centered on the doll's nose (you can use a ruler to determine where the center line of the nose matches the area below the doll's waist). To fit the basic pant sloper to the base of the doll's torso, cut a line from the unused long edge of your interfacing, back to meet the center line you drew for the doll's torso in the last step. Cut it so it is just above the base of the doll's torso. If you cut the line too deep, you can adjust the sloper by adding a scrap of extra interfacing to the leg sloper where it meets the bottom of the doll's torso. If you have cut the excess material successfully, you should be able to trim the front edge of the pant sloper away from the line your marked for the torso center, and wrap the rest of the fabric around the front of the leg without seeing fabric pulling at the base of the doll's torso. (see photo next page). Continue to 6 of 14 below. After you have trimmed the excess fabric away from the center front seam on the doll pant sloper, gently curve the interfacing around the doll's leg, without pulling on the fabric taped to the leg or the waist. Mark the curve on the bottom of the doll's torso so it meets the center front seam line, trimming away the fabric at the top of the inner leg if necessary to match the curve of the base of the doll's torso. See photo above. The line of the pant leg will be smooth, and will not fit tightly against the doll, except in the hip area. Continue to 7 of 14 below. 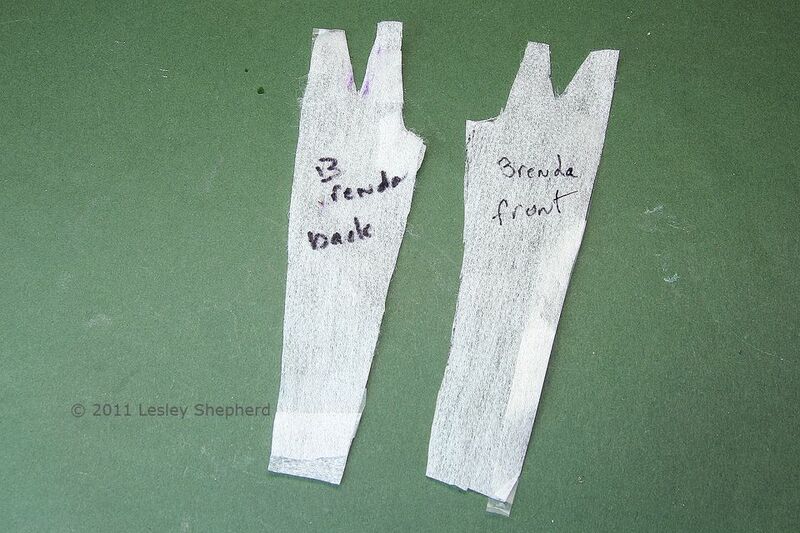 With the center front pant seam line fitted to the base of the doll's torso, use a pencil or pen and a ruler, to mark the inner seam line for the doll pant sloper. This inner line should run straight down the center of the inside of the doll's leg as shown in the photo. The fabric should drop in a fold from the widest point of the doll's leg, down to the ankle. You do not need to pull the fabric tighter closer to the ankle. The sloper will give you the pattern lines for adapting the leg design for a pants pattern from a straight leg to a more fitted leg if you wish. Continue to 8 of 14 below. Mark the front darts of the doll pant sloper by folding the excess material at the waist so it makes a triangular dart that points down the center front of the doll's leg. Use a pencil or pen to mark both sides of the fold so that you will be able to see the complete v shape when you unfold the front pant sloper pattern. Remove the pattern sloper carefully from the doll and trim the inner leg seam line. Unfold the dart, and mark the sides of the triangle for the waist dart. Cut the waist dart open. Check the fit of the completed sloper piece against the doll and compare it to any commercial pants you have for this doll. The sloper pattern should fit the doll exactly with no extra fabric, except along the front of the leg, where the fabric falls for the front of the pants. Start Making the Back Pattern Piece for a Doll Pant Sloper. The back pant sloper for a doll is made the same way the front sloper is made. Begin by cutting a piece of interfacing with a straight edge to go along the outside of the doll's leg, matching the center line of the outside of the doll's leg. Tape the interfacing to the doll's leg, this time so the extra fabric is facing the back of the doll, and gently wrap the interfacing toward the back of the doll. Mark the back waist of the doll along the interfacing. Some doll's have an upper and a lower waist, divided by the ball used for the waist join. The upper waist is the one you want to use for the sloper. The lower waist usually marks the start of the hips. Continue to 10 of 14 below. Mark the center back of the doll pant sloper pattern to the base of the doll's torso. Photo copyright 2010 Lesley Shepherd. Trim the interfacing to the waist line of your doll and tape it in place. The interfacing should now be taped to the outer doll's leg and the doll's waist. Do not worry about any gaps in the interfacing at the doll's waist. Draw a line down the center back of your doll's torso onto the interfacing, using a ruler if necessary. Keep this line as straight as possible as it will mark the back seam line for any pant patterns. End your mark at the base of the doll's torso, and trim away the excess fabric to allow the leg sloper to be fitted against the base of the doll's torso, as you did for the front pants sloper. Continue to 11 of 14 below. Mark the curve at the base of the back of the doll's torso on the pant sloper back pattern. Photo copyright 2010 Lesley Shepherd. Trim away the excess fabric from the back middle marking for the doll's torso and gently bring the fabric for the doll pant sloper around the back of the leg. Draw the curve of the base of the doll's torso onto the fabric sloper and trim the curve to fit the base of the doll's torso as shown in the photo above. If you trimmed the fabric too low before you moved the fabric around the back of the leg, you can add a bit of extra fabric in at the base of the doll's torso to get the correct curve for the top of the inner leg. Continue to 12 of 14 below. With the lines for the center seam around the back torso trimmed and fitted to the torso, lay the fabric along the inside of the doll's leg and mark the center seam down the center of the leg. The fabric should be touching the back of the leg at the widest part near the hip, but should not be pulled tight to fit the ankle. Keep the fabric rolled at the back of the leg straight and square with the side of the leg and use a ruler to mark a line down the inside center of the doll's leg. Mark the leg as far as the top of the foot to indicate the full length of the leg on your basic pattern sloper. With the pant pattern trimmed and taped to the outer and inner edges of the doll's back leg, gather up the excess material at the doll's waist into a small triangular pleat or dart. Line the fold of the dart up so the point of the dart is aiming straight down the center back of the doll's leg. Some dolls with larger waists may not have any need for back darts. Mark both sides of the V of the dart so that you will be able to see it clearly when you undo the fold. Remove the back sloper pattern from the doll and trim away the inside of the back darts. Continue to 14 of 14 below. Test fit the pattern to your doll, checking that the seam lines on the outer and inner leg edges match for the back and front sloper pattern. Check that the leg lengths are even at the outer and inner leg seams where the back and front pant sloper patterns meet. If necessary add scraps of interfacing to legs which are too short and adjust the leg length. When your basic sloper pattern is adjusted, trace it carefully onto kraft paper, a piece of printer paper or slightly heavier weight non woven interfacing and label the patterns with front and back, and the name of your doll. Keep the original sloper and the basic paper sloper to make patterns in a range of pant styles to fit your doll. To use the sloper patterns, decide on a pant style for your doll. Use the basic pant sloper to draw the smallest possible pattern adding in seam lines and lines for a hem at the waist and lower pant leg. You will need to adjust the pattern seams and seam lines to allow for the thickness of the fabric you choose for pants for your doll, as well as the way your doll bends, the pose you will want the pants to fit in, and any particular fitting issues for your doll (feet which don't point down for example must have wide legged trousers in order to fit over the doll's feet. Adjust your pattern to make sure you can fit the pants onto your doll. Back seams work well for doll's with large hips. Dolls for young children may be best fitted with elastic waists rather than fitted waist seams.